Fishin is the activity o tryin tae catch fish. Fish are normally caucht in the wild. Techniques for catchin fish include haund gatherin, spearin, nettin, anglin an trappin. The term fishin mey be applied tae catchin ither aquatic ainimals sic as molluscs, cephalopods, crustaceans, an echinoderms. The term is nae normally applied tae catchin fermed fish, or tae aquatic mammals, such as whauls, whaur the term whaulin is mair appropriate. Accordin tae FAO statistics, the tot nummer o commercial fishermen an fish fermers is estimatit tae be 38 million. 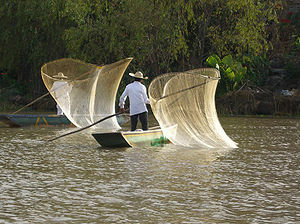 Fisheries an aquacultur provide direct an indirect employment tae ower 500 million fowk. In 2005, the warldwide per capita consumption o fish captured frae wild fisheries wis 14.4 kilograms, wi an addeetional 7.4 kilograms hairstit frae fish ferms. In addeetion tae providin fuid, modren fishin is an aa a recreational pastime. ↑ Fisheries and Aquaculture in our Changing Climate Policy brief o the FAO for the UNFCCC COP-15 in Copenhagen, December 2009. 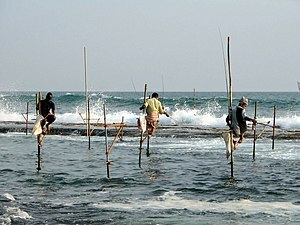 ↑ "Fisheries and Aquaculture". FAO. Retrieved 2012-07-01. This page wis last eeditit on 28 Februar 2018, at 08:59.